On the shores of Chequamegon Bay. Washburn...dazzling beaches, crisp waves, breathtaking sunsets, burning fall colors, pristine lakes and miles of rivers and streams for canoeing, swimming, fishing and kayaking. Your destination, a town rich in history, lore, and a wide variety of activities that are sure to captivate you and your family. Washburn's north coast offers an assortment of simple pleasures for visitors. There is a scenic, lakeside hiking trail in town and recreational trails for hiking, biking, ATV riding and snowmobiling nearby. We offer two lakeside parks with campgrounds, and the "Big Lake" - Superior, for sailing, boating and year 'round fishing experiences. This historic town has interesting antique shops, wood carvings, pottery, paintings and old books. Washburn is home to the Washburn Historical Museum and Cultural Arts Center, an 1890s three-story brownstone building, featuring local history, art exhibits and a unique gift shop. Full of activities for young and old alike, Washburn readily invites you to explore our community, share in the activities and events, and get a sense of our history. The Washburn Lakefront Parkway and Walking Trail consists of a shoreline corridor extending from Thompson's West End Park and Campground to the City's Athletic Fields. The parkway weaves among the beaches and bluffs of the lakefront. The trail consists of a walking path of limestone screenings with resting benches occasionally placed along the route. The western portion of the trail has been made ADA accessible with the assistance of a Coastal Management Grant from the Wisconsin Department of Administration. The grant provided for widening of the path and the bridging of several ravines. 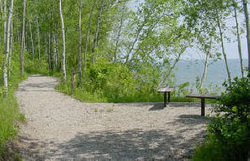 Users of the eastern portion of the trail will still encounter steps to traverse the remaining ravines and descend the lakeside bluff to the marina. 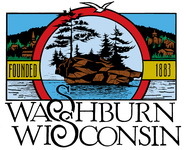 Visitors to the trail will be taken on a trip into Washburn's past with numerous informational signs describing the community's former waterfront industries and activities. Access to the trail may be obtained and parking available at the the trailead along 6th Avenue West, the foot of Washington Avenue, Marina Drive and Central Avenue. In 2002, the City choose to participate in the Maritime Trails program of the Wisconsin Historical Society. Additional signage, the result of a gift from the Society, will be placed along the pathway describing the City's association with maritime industries.